I am looking for a set of sealed beam headlight conversion kits for our GE44 Tonner, Currently our locomotive has the "Golden Glow" single headlights and I know I have seen these retrofitted with twin sealed beam units that fit behind the orrginal glass. Does anyone know who made these or have a set they would like to part with? The beam was good enough that the brakeman for the event didn't need his flashlight, when he was about 500 feet down the track and I was able to see individual ties about 300 feet out from the cab. As we don't normally run at night I am not sure how this beam compares to how the original bulbs ran, while we still have 1 OEM bulb left, we were having switch issues and haven't tried it since I cleaned the switches. It definitely illuminated out more than far enough for our uses, but all our operations are within our site and not on a mainline. Ok let me ask this does anyone know what these lights were called that would mount a twin headlight in the space of a first generation diesel locomotive golden glow pyle socket? Not having much luck here finding anything on google but I know they existed and many F units had them. 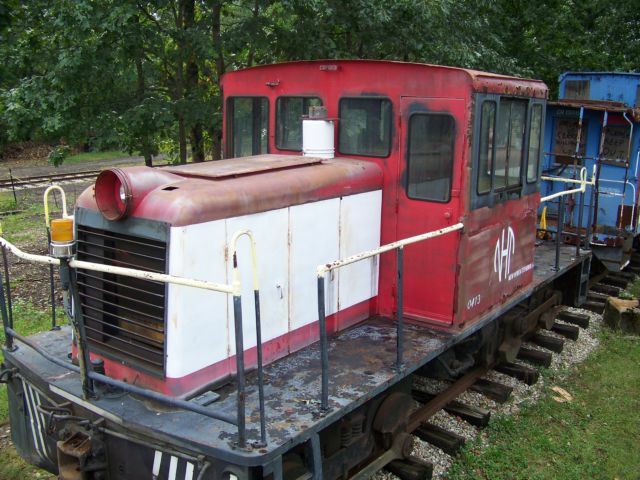 We would like to upgrade our locomotive for better visibility and having two bulbs is better then one. If those dual bulb headlights used the same parts as the older steam locomotive common 14", or even the less common 12" cases, from the 20's and 30's, then you would only need one part, it would replace the reflector of those older headlights. Its probably a very rare part. You might have to locate a locomotive at a RR museum that has that specific headlight and try to make arrangements to borrow that one part, have it scanned, and reproduce it. Not sure why the PM is not working or sending but I sent you a PM . I think I have what you need. If you are asking about the metal casting that held the two sealed beam bulbs then you are looking for: MARS Signal and Light. My steam locomotive headlight has this conversion insert. I would be concerned that it would be an awful lot of heat to remove from that housing. Barely 3% of the energy pumped into an incandescent or halogen bulb leaves as photons; the rest lingers as heat. The fixture is rated for a single 250w bulb, the typical modern dual headlight is 2x200w. That doesn't even make it 3db brighter. That's the difficulty of light - it works on a log scale. As far as two bulbs are better than one, that seems like a wives tale. It creates a more complicated system that is more difficult to maintain. Now you have two resistor banks instead of one, or if wired in series to avoid resistor loss, both bulbs fail at once. Otherwise two homeruns, two resistors (yes you still have those), two fuses, two dim/bright circuits, double pole switch at least on the dim/bright, etc. In any case the Class Is do that because they don't want train crews changing bulbs. They want the unit to be able to limp along with a single 200w bulb burning. That's not about safety, it's about union rules. Changing a PAR is a chore. The old style screw-in Edison bases can be changed in 30 seconds by any crewman. There's also an FRA issue. They are very, very persnickety about headlights meeting specific standards, so you may be better off staying with a grandfathered design rather than prove something new. Whereas they let the market innovate with ditch lights. And that's where I would focus if safety is truly the intent. Ditch lights have a much wider spread and you are free to aim them where you want, like down the angle of your problem crossings. You WILL be seen! On a museum unit the ditch lights can be well concealed to avoid wreckingthe appearance of the unit, especially with LED. Nowadays LEDs open up so many possibilities because there's no upper limit on brightness, and you can strobe them at MANY times continuous rating. If the concern is detecting an out bulb, that's easy, any electrical guy with a scrap of smarts can build an out-bulb alarm. What diameter is your headlight? I assume you are talking about #75. That light looks smaller than the bigger loco headlights. Our 50 toner has a housing on each hood with a single standard sealed beam. Works just fine for everything we do. I think the adapter you are looking for is the ones on our rs1, but those look way to big to fit on your housing. I will snap a photo tomorrow of the 50 ton lights and the adapters on the alco. Well, maybe. We're tire-kicking a lot of different options for the long term. Mostly I am looking at options as I am unsure of the long term viability of our current setup, it works but for how long and as time goes on how long will we be able to obtain parts for a dying standard. I had just remebered this weekend that our RS1's have these fixtures as well I will have to do some investigation this winter as our RS1's are stored in remote locations. Long term viability? Not much of a dying standard. It's a light bulb and a resistor. Pretty much every diesel locomotive headlight still works that way. Our 45 tonner has been running just fine with it for 25+ years and changed out a bulb maybe 2-3 times? As was stated here earlier, two bulbs aren't necessarily better than one. I would highly advise you to try the bulb that crij recommended before you go tearing the housing apart. It's a lot less headache to swap out a bulb than try to retrofit an ugly dual sealed beam assembly in a housing where it doesn't belong. What I meant was we are using a bulb currently that is special made for historic locomotives. If this single source dries up then what? I really do not want to start cutting into the hood and weld in a new box to house a modern locomotive headlight. I figured that this was done to many F units and other first gen power and that there may be some around. A possible future solution to your issue is LED bulbs. It should not be too much longer until the bulb producers have the LED lights on the market, that are large enough to the equal the output of the old 250 watt bulbs. The power draw required for the same quantity of lumens using LED chips will be only 50 watts. For the steam train lighting, our turbo generators will not need to be worked so hard when the LED bulbs get good enough, and inexpensive enough, to use in every socket. LED lights should last longer, and should also be more resistant to shock, so maybe LED will be great for railroad use. We'll have to wait and see. While I was looking into bulb options, I examined the possibility of making a LED replacement, unfortunately for a 250W equivalent LED, which I figured needed 3-5 of the latest Cree XP-L LED modules, 1096 lumens on a 3.5mm square emitter, 115 degree illumination as 250W incandescent bulbs are 2500-3000 lumens. http://www.cree.com/xlamp/hi You would also need to install a large heatsink (close to the size used on a 4 core computer processor [I3 processor IIRC]) attached to the LED emitter, otherwise the life is shortened quickly. Even if I removed the socket and pushed it through the reflector from the backside, I don't think there would be enough airflow in that area of the hood because of the top of the radiator blocking the airflow, fans could be added, but didn't find a source for 64-72v fans and didn't want to waist the electrons with resistors or inverter-transformer-rectifier assemblies to lower the voltage to run a 4-6 inch off the shelf fan. Then you have the other problem, LED lights don't illuminate as far as an incandescent for the same lumens output. If you really want to use one of those par bulbs instead of an screw bottom bulb, just do what the industrials normally do, remove the reflector and door(with glass) and mount the holder for a single 64v 2 wire terminal bulb, you won't fit a double light in the housing of a 44 tonner, the pair of bulbs plus retaining rings are larger than the OD of the door. Unfortunately the conversion tends to look ugly, and not historical. Let's see, I'd use a cluster of 7 of them, from group V2, run them at 1050ma so 400 lumens per emitter or 2800 total. Forward voltage would be ~2.95 volts per emitter or 20.65v the stack. @1.05A that's 21.6 watts. I think you'll be ok.
130 lumens/watt. Not bad. In practical terms you'll get more light than OE, because it's all focused through optics instead of only 60% hitting the reflector to get focused at an 8 degree angle (the rest scattering out the front or illuminating the socket). fans could be added, but didn't find a source for 64-72v fans and didn't want to waist the electrons with resistors or inverter-transformer-rectifier assemblies to lower the voltage to run a 4-6 inch off the shelf fan. You are stuck needing a switching constant current power supply for the LEDs. In for a penny, in for a pound... might as well have another one for the fan. Assuming that's even needed to get rid of 22 watts. The housing is designed to dissipate 250w at a temperature well below the failure point of an incandescent bulb, which is when the solder melts. The question is whether you can cram a 22 watt heatsink in roughly the space of the OE bulb that would keep LED temp uniformly below 85C at all times inside the enclosure. At least you know the bulb orientation will be horizontal. Why do all that? Just make a holder for a PAR that screws into an E26 base and has some rubber bumpers so it can rest on the old reflector. Jumper across the old resistor. Fully reversible.